Years ago somebody put together a handy reference booklet that correlated to the American Edition of Luther's Works (published by Fortress Press) the various German editions of Luther's Works. Would anyone out there in Luther Quest land know of how this can be obtained? For example, if I have a Luther citation that is identified as WA 40 1 128-129, I could like to know where (if anywhere) I could find that reference in the American Edition of Luther's Works. Any help would be greatly appreciated! Many years ago I bought the CD ROM of Luther's Works in English (LW). I was naive enough to think that all one needed to do was put a quote in the search engine, and voila! There it is! I Then discovered that not all of Luther's writings had been translated into English and these other writings were in either German or Latin in something referred to as "WA" (WA. D. Martin Luthers Werke. Kritische Gesamtausgabe; Weimar). I then discovered that there were references to WA that were in the English LW, but I had no idea how to cross-reference between WA and LW. 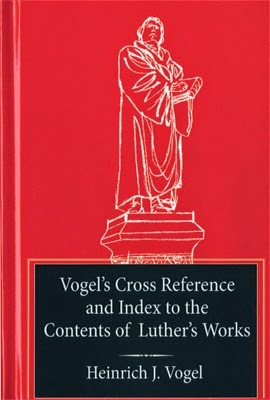 I recall specifically writing one of the folks over at Concordia who referred me to Vogel's Cross Reference and Index to the Contents of Luther's Works. This book, now in print for $40, was at that time, out of print and well over $100. As much I enjoy looking up quotes, there was no way I was going to spend that much for the book. There were Luther quotes I've spent hours searching out. To deal with a reference to WA, I had trudge over to a college library. Then of course, there's the hurdle of German and Latin, and then to top it off, many of the the old volumes of WA are in an older German script that makes even identifying the letters a nuisance. In most cases, I was able to figure out which writing in WA was being referenced, and then I was able to cross-reference LW. But now, with the explosion of information posted online, cross-referencing between WA and LW takes me a few minutes. Very helpful is An Index to the Works of Martin Luther. Here though is a system I've devised that I've used for quite a while now. It may seem a bit cumbersome at first, but after you do it a few times it'll take probably less than 5 minutes to use. The difference between my system and the index link just posted is that my system includes the recent editions of LW that have been published or will be published, and my system will usually result in an exact page cross-reference. As an example, I'm going to use the Luther Quest reference above, WA 40 1 128-129. Keep in mind, I have no idea which writing from Luther's is being referenced, or even what quote is being sought for. I've tried to make these instructions as detailed as possible knowing the some folks aren't as computer savvy. 1. Go to Luther's Works Complete Tables of Contents and Cross Listing. [If by some chance, this page isn't working or is no longer available, go to the Internet Archive and use the Wayback Machine "Browse History" feature. Place the link "http://therebelgod.com/Luther/" in the search box. You should see then see this. Choose one of the dates highlighted and click on it. If you choose one, you should see the page, Luther's Works Complete Tables of Contents and Cross Listing. I also have the page saved on my hard drive]. 2. Once you're on the webpage Luther's Works Complete Tables of Contents and Cross Listing, on the left side of the page, click on the button that says "Expand All Lists." 3. From your web browser, locate the "find" feature. On Google Chrome, this is found on the top right corner in the pull-down menu. On Internet Explorer, it is found on the top left pull-down menu that says "edit." The feature you're looking for is "Find on this page." For Internet Explorer, sometimes to get the "edit" menu to show, you have to hit your "Alt" key on your keyboard. Once found, click on "find" or "Find on this page." A pull-down text box menu should appear. 4. In that box, type in WA 40. All the times WA 40 is mentioned on the page will be highlighted (10 times, to be exact). Scroll through them, and look for all the references to WA 40 1 (you'll also see references to WA 40 II and WA 40 III). If you've done it right, there is only one reference to WA 40 1 (it will be the 5th mention out 10 times). It will say, "Volume 26: Lectures on Galatians, 1-4 (WA 40.I)." The "Volume 26" refers to the English edition of Luther's Works (LW). Now you know which volume the quote is in, Volume 26- Lectures on Galatians, chapters 1-4, but you still don't know the page number in LW. 5. Go to the webpage D. Martin Luthers Werke, Weimar 1883-1929. This webpage contains many of the WA volumes. Scroll down the left column that says "Band" and locate 40 1. Volume 40 1 is entitled "2. Galatervorlesung (cap. 1-4) 1531." On the far right hand columns, there are three formats by which to view this book. I prefer using the "Flip-book" format. Click on the "X" and it should open up WA 40 1. The pages we're looking for are 128-129, so locate those pages, you should find this. You'll see that it's Luther's lectures on Galatians in Latin. This example is easy, because at the top it says "In epistolam S. Paul ad Galatas Commentarius, [1531.] 1535. (1,12). The (1,12) is chapter 1 verse 12. So, simply go to LW 26 and find the pages that are specific to Galatians 1:12. In LW, they start on page 61. 6. To locate pages 128-129 from WA 40 1 in an example like this, what I would do is flip back a few pages in WA 40 1 to see where the comments on Galatians 1:12 begin. They start on page 126. So, WA 40 1 page 126 is LW 26 page 61. Sometimes what I would do is count the paragraphs in WA from page 126 to to the page in question (page 128). There are 7 paragraphs of Latin text between pages 126 and 128. I then go LW 26 page 61, and begin counting 7 paragraphs. This brings me to around page 62. So, pages 128-129 in WA 40 1 are probably pages 62-63 in LW 26. If the Luther Quest person had posted the specific quote, I would then look for key words in the Latin text (names and Bible verses) as identifiers, and then look for those same identifiers in LW 26. You'd be surprised how often Luther uses a proper name or a Bible verse. Sometimes LW doesn't use WA, so that's a whole different ball game. Yes, I have a system devised for non-WA references as well. At this point, I really don't see any need to spend $40 on Vogel's Cross Reference and Index to the Contents of Luther's Works. Cross-referencing quotes to older editions of Luther's writings is a bit more difficult, and Vogel would be the quick fix. However, I've gotten so accustomed to figuring it out myself, I've grown to enjoy the challenge. The most helpful thing Concordia has done is that with the new editions of LW they put out, they include the WA cross-reference on the top of each page. Not directly related to your post, but I have a question maybe you know the answer. Did Luther write or say, "Preach the gospel to yourself everyday" ? I have heard people say that he did, but I cannot find it by google. the statement seems to confuse justification with sanctification. "Meditating on what Christ has done by justifying us is not, from the human perspective, what brings about our progressive sanctification (it is not the scriptural modus operandi for or the practical key to it). Obeying Christ’s commandments (in the power of the Spirit and from a heart that is properly motivated) is what does. Understanding justification (and being appreciative for it) is our primary motivation for sanctification, not a principal means of it." Apparently, Lou Priolo changed his web url address. Great quote, intriguing. Probably not Luther. Looks like I'll be adding that one to the list.